The original Predator is memorable in creating an enduring sci-fi villain with a rather fresh twist. He’s not a mindless drone or persistent robot, no, he’s a fairly clever intergalactic hunter with humans as his prey. Predator 2 hasn’t handled the test of time quite as well, and is remembered mostly for its odd casting of Danny Glover in the hero role, and the scene where Gary Busey gets sliced in twain. Predator 2 the game is the expected cash-in of equivalent quality. That's my spine you've got there. I'm going to need that back. The game parallels the plot of the film without telling the story, so you’ll have to have seen the film to understand the scenes each level references. Basically, there’s a massive gang war ripping through Los Angeles, and the violence attracts the Predator and camouflages his actions. You play as Detective Mike Harrigan trying to both quell the violence and uncover the truth about the existence of the Pred. For the game, this means that every level will be populated with endless numbers of generic street thugs, who replenish their forces through one-way doors smattered about the level. The Predator is limited to occasional appearances as a boss. The whole “wily alien hunter” gig has been pretty much dropped, so the Predator here is notable only in the special weapons he uses and the incredible amount of damage he can sustain. There are seven total levels, all viewed from an overhead perspective similar to the appropriate levels in Demolition Man. That number may seem short, but not so much when you consider that you’ll be doing the exact same things in each and every level. You’ll shoot waves of street toughs a la Smash TV, and rescue the hostages they have taken. 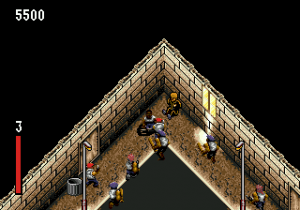 Each level has anywhere from six to fourteen captured citizens, and saving each determines when you can head for the exit and battle the boss. But here’s the twist – the Predator, for no real reason at all, will be systematically killing each hostage. It goes against his character as established in the films, but acts here as a convenient timer. His patented tri-laser aiming system will creep along the street with appropriate sound effects, giving you a visual indication of how long you have to rescue the next hostage. If the laser makes it over them, they’ll die gruesomely and the Pred will move on to the next hostage. Your difficulty level determines how many hostages can get greased before you lose the level, and their current death tally is marked with bloody skulls in the upper right corner. 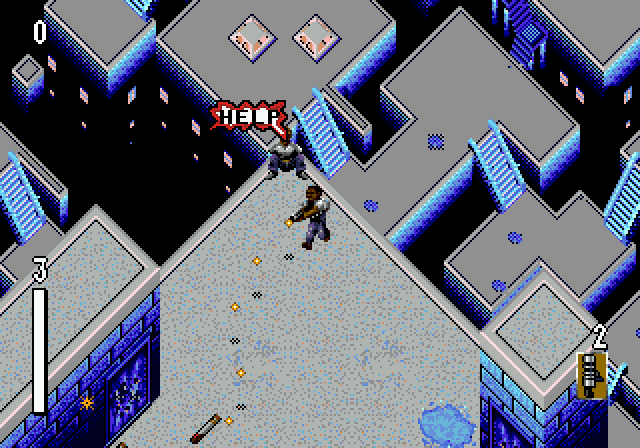 So the entire game is about rushing down streets and alleys, following the shouts of “Help!” from the next hostage, and freeing them before the Predator can shoot them. 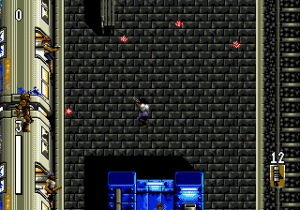 The gangbangers really just run interference, and the weapon powerups mostly define how quickly you can cut a swath of corpses to the next hostage. You have a flak jacket that defines your health, with more energy and more lives both available as pickups in the gameworld. There are occasional barriers along the way, like parked taxis being used as gun bunkers, or helicopters used as gunships, and the heavier weapons can deal with these appropriately. The heaviest of these weapons come from the Predator himself, and are the only ones that are kind of cool. However, they’re not that unique since they’re really just an excuse to ground typical arcade weapons in the game’s reality; like spears that travel through all enemies on the screen, or a disc that flies around in a protective circle. The Predator as a boss isn’t particularly inventive or cunning either. He appears on the scene and promptly launches a barrage of every piece of ordinance he’s got. Laser balls fly, capture nets shoot out, all while he stands perfectly still and watches. He sort of fights like a girl who just starts whipping both hands around as fast as possible. He will continue to soak up damage until an invisible quota has been met, after which he’ll run off. The other major weapon in the film Pred’s arsenal was his cloaking device, which he used to sneak around and make stealthy kills. In the game, he simply turns more invisible based on the amount of damage he’s taken, until he fades away and runs. If you’re expecting any craftiness at all, you won’t find it here. That's the Predator on top of the subway car. I know, it's hard to tell. It’s not too bad graphically, and each level does look distinct from the last. The rooftop level is a particular highlight, with a nice simulation of height in the background. The overhead perspective works reasonably well, and you can see all oncoming enemies easily without any of them being blocked by the terrain. Characters move fluidly, but aren’t overly detailed. The Predator suffers from this the most with only two shades of black and brown used to define him. Honestly, he sort of looks like a tree. There are, however, a couple of sharp movie stills introducing each level, and an occasional very detailed Predator head appearing the corner that seems to signal when he’s begun his hostage hunt. Despite all the shooting and violence, the game itself isn’t too gory. Most characters disappear in little explosions of fire when shot. The contrasting exception are the hostages, who get utterly mauled by the Predator’s laser. They will explode into body parts and that launch toward the screen. A similar fate awaits you if you should try and cross the Pred’s roaming laser sight. Controlling Mike as he plows through his enemies isn’t too difficult. Your character only defaults to cardinal directions when standing still, which seems odd when almost all passages in the level come at angles. So, if you have foes coming at you from down the street, you will have to press a diagonal direction on the pad to aim at them, which also sends you charging in that direction. This is offset by the ability to lock your current aiming perspective with the B button, so you can fire and strafe without turning or losing your angle. The A button fires while allowing you to move freely, and is helpful for firing while navigating, or when you’re surrounded. The C button cycles through the weapons you have picked up along the way. Music is a bit of a letdown, with totally generic themes throughout. The intro theme sounds like it was taken from one of those royalty-free compilations, where the artist just recorded something with no concept of how it would be used. It doesn’t match the Predator, and the game never even attempts to replicate the film’s classic jungle-esque beat. Later levels, as you get closer to the Predator and his ship, start to fall into the “generic: creepy” category, but there’s nothing memorable here. Effects are rather standard themselves, with the highlight being the “Help” and “YES!” digitized shouts. They’re the highlight because they sound clean, and they actually can be helpful in locating someone – though the levels are so linear that it’s hard to call any hostage truly hidden. As an interesting note, I didn’t recognize any of the Predator weapon sounds as being from the movie, which I guess means that Fox didn’t even let the developers into the library. Regular weapons sound rather beefy though, and each one certainly manages to sound distinct. As you’ve probably inferred, Predator 2 is fairly average, and neither a great showcase of being a Predator or fighting one. Some franchise-specific ideas do make it in, and I perversely like the concept of rushing to save a hostage before the Predator kills him, despite the fact that it doesn’t fit with the canon. 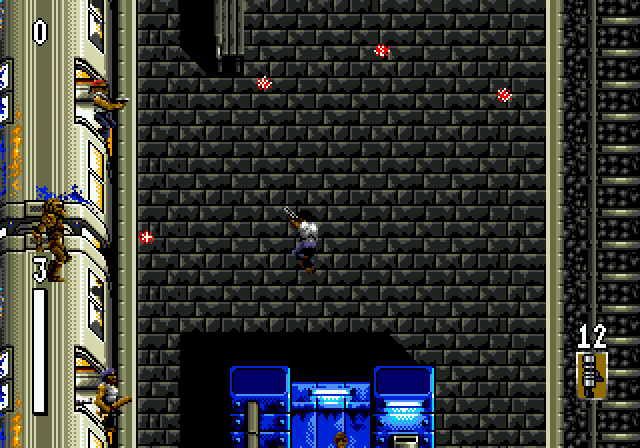 The gangbangers offer nothing but a rudimentary distraction, and the seven levels are an appropriate length only because the game offers nothing new beyond the first level. Fairly standard, mildly enjoyable save-the-hostages routine. Not much Predator-specific to make it worthy of the title.